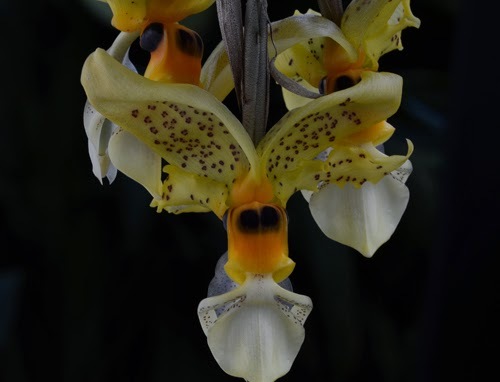 Stanhopea wardii is one of a handful of Stanhopea species that is regularly available in the commercial trade. 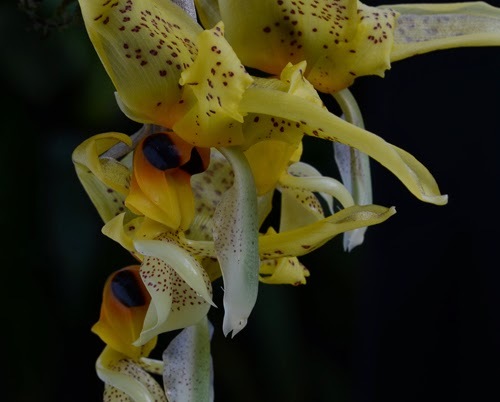 And although I wouldn't describe any Stanhopea as a true beginner's orchid for north temperate climates simply because they all require a greenhouse or tropical/subtropical climate, wardii is a good starter Stanhopea. It is one of the widest ranging in geography and elevation, from Nicaragua south through Colombia, Venezuela and northern Brazil at 800 to 2700 meters (2600 to 5300 ft.). Humid intermediate temperatures (58º night minimum) and 60% shade is what S. wardii wants. Our plants grow vigorously and flower reliably in late summer and early fall. The two main components in the fragrance of some wardii clones are 1.8-cineole and phenyl-ethylacetate. I can hardly detect the camphorous smell of cineole in this clone, but rather a heavy honey-like scent with a hint of resin.